hen Parker decided to moth ball the brand name Duofold it was after a long descent from the most expensive pen that sold in the millions to a flagship going down. 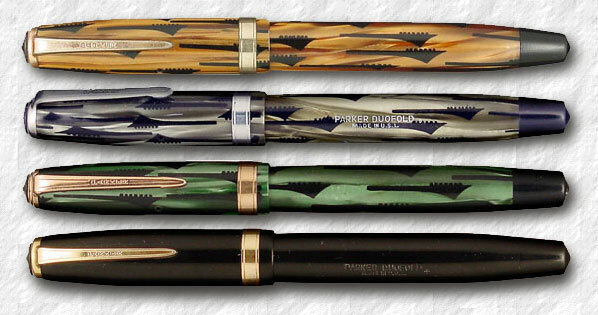 By 1933 the new kid on the block was called Vacumatic and it was everything the the Duofold wasn't. The Vac had an interesting pattern, filled the double amount of ink and had a new, attractive clip that was to be the trade mark for decades, the Parker arrow. So... it came as a bit of a surprise when Parker re-introduced the Duofold in 1939. It was even more a surprise that the new Duofold was a cheap model aimed for the economy market. t did come in an attractive design, often referred to by collectors as the Geometric or even Toothbrush pattern. It was based on an earlier economy pen, the 1937 model Challenger, and sported a plain tapered clip, engraved Parker. All four Geometric Duofolds from 1939.
t had a plain cap band and was offered in two sizes and four colours; green, grey, brown and solid black. As with the Vacumatics the grey pen had nickel trim, while the others had gold trim. nother interesting feature was the Visiometer ink vue, introduced on the Parkettes of the 1930's, but since the novelty vacumatic ink system was a big hit Parker put a fake tube (in fact a solid rod) inside the Visiometer to give the impression that the Geometric Duofold was also a Vac-filler when it in fact was an ordinary button-filler with a sac. It was not a success and was discontinued in early 1940, the brother-pen, the Challenger followed within a few months. In spite of the poor quality (which has left few minty pens to later collectors) but perhaps because of the attractive design, the model is very sought for and often bring high prices. Maybe too high in comparison with other quality Parker pens from the same period. It was replaced by the equally attractive ( and illusive) Zephyr.